Have you ever dreamed of sailing in the sunshine on your own yacht? This is where you can begin to make those dreams come true ... and the good news is that you won't need a huge budget or lots of sailing skills. 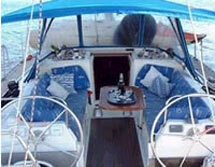 Yacht Valentine was purpose built in Greece for holiday sailing the Aegean. George and Melody Burton, her present owners, offer skippered sailing holidays and sailing school weeks for two to four guests. We specialise in holidays for couples, singles, or small families who want a relaxing holiday based around sailing, sightseeing, and swimming. For a couple, we offer a master cabin with en-suite toilet / shower in the bows. For two couples, singles, or a family* there are two double guest cabins aft, each with en-suite toilet facilities. * 1 or 2 children sharing a cabin. Join us for a cruise around some of the Greek islands, or explore attractive, unspoilt areas of the coast of mainland Greece.